I doubt I am alone in saying I have had enough with Hollywood’s obsession with O.J. Simpson-related productions. ABC is testing America’s obsession with the disgraced former Buffalo Bill, network announcer, actor and commercial spokesman with “The Fix,” which premieres at 10 p.m. today on WKBW-TV (Channel 7). It is a thinly veiled 10-part series that plays like a fictionalized version of the infamous Simpson murder trial. With Simpson lead prosecutor Marcia Clark as one of the executive producers, it is the most unnecessary program of the year. Marcia, Marcia, Marcia. What were you thinking? I think I know what ABC was thinking: Let’s try to milk every ounce out of the Trial of the Century in which Simpson was acquitted of murder in the death of his former wife Nicole Brown Simpson and her friend Ronald Goldman. Let’s have Clark live out her fantasy of finally putting a Simpson-like character in prison for life. After all, celebrity cases usually spell big ratings for entertainment programs and news programs. A few weeks ago, I was a little stunned to see R. Kelly’s rant in front of CBS interviewer Gayle King as the lead of the nightly newscasts when so much more important news deserved that attention. It was news, but top of the news? Not if you apply old news standards. I also was surprised that the death of former “Beverly Hills, 90210” star Luke Perry got so much attention in the national newscasts. Sure, Perry was beloved by a generation that grew up with him, died relatively young and deserved attention. But if you watched the networks, you might have thought he was Gregory Peck or Spencer Tracy. But I digress. Back to “The Fix,” a truly awful network series that gives celebrity dramas a bad name. As one critic suggested during a news conference in Pasadena, Calif., last month for the series, it should be named “Marcia’s Revenge.” Clark even brings up the phrase “fantasy revenge” in the constant ABC promos for the series. She seems to be borrowing the comment made by the critic so even the promos aren’t original. 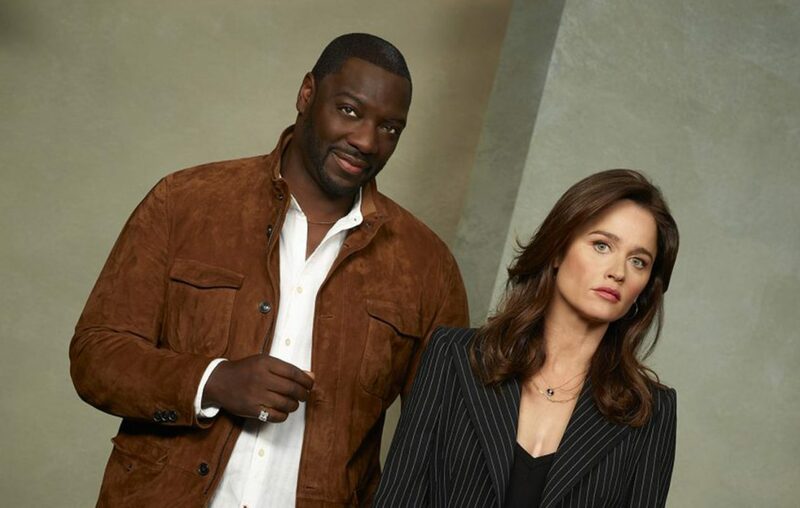 In “The Fix,” Robin Tunney (“The Mentalist,” “Prison Break”) stars as Maya Travis, a character with some obvious similarities and differences with Clark. Travis is a lawyer who was so heartbroken after losing a double murder case in which an A-list movie star was accused of murdering his ex-wife and a friend that she escaped to the state of Washington with her cowboy husband. She is happy in her life but when the acquitted star, Sevvy Johnson, played by Adewale Akinnuoye-Agbaje, becomes the suspect in the murder of his girlfriend she is persuaded to come back to Los Angeles eight years later to finally get her man. Breckin Meyer plays the district attorney, Scott Cohen plays a slick, ethically questionable defense attorney and Merrin Dungey plays an assistant district attorney who is miffed that Travis lost connection with her after the trial that devastated Travis. I hope that made Clark feel better. In the first two episodes available for review, there is the usual office politics, as well as some family drama. One of the suspect’s children blindly supports him and helps hide what appears to be evidence. Another child questions her loyalty. Like Simpson, the egotistical suspect thinks he can charm the authorities. He agrees to be interviewed without a lawyer. There also is footage of his alleged physical abuse. The father of a victim is angry. Of course, he is angry at the movie star. But he also is angry at Travis for losing the case. If it sounds bad, it is even worse than that. The question for the viewer isn’t so much whether the movie star is dumb enough or violent enough to commit murder after being acquitted in a previous case. The question is whether viewers are dumb enough to watch it based on ABC's nonstop promos highlighting reviews from publications they've likely never heard of or read. In a press conference in Los Angeles, Clark, her co-producers and the cast tried to make the case that viewers will have to decide whether they think Sevvy is innocent or guilty. My advice: Avoid “The Fix” and just rewatch FX’s 2016 award-winning series “American Crime Story: The People v. O.J. Simpson” all over again.